Obituary for Helen D. Shannahan | Edwards Memorial Funeral Home, Inc.
Mrs. Helen Frances (Doherty) Shannahan, 87, of Holliston, MA, died Saturday evening, December 1, 2018, at St. Patrick’s Manor in Framingham, MA after a period of declining health. For 56 years, she was the beloved wife of the late John Martin Shannahan, who died in 2009. Mrs. Shannahan was born in Milford, MA, the daughter of the late Daniel F. and Mae K. (Miller) Doherty. She attended the former St. Mary’s Grammar School and was a graduate of the former St. Mary’s High School, Class of 1948. She was also a graduate of The College of New Rochelle in New Rochelle, NY, Class of 1952. Mrs. Shannahan was first employed as a second grade teacher at the former Claflin Street School in Milford. Following her marriage and raising her family, she worked as a substitute teacher in the Holliston public school system. She was later employed as an administrative secretary for Dr. James Morin DMD in Milford, MA. Mrs. Shannahan had been a resident of Holliston, MA since 1956. 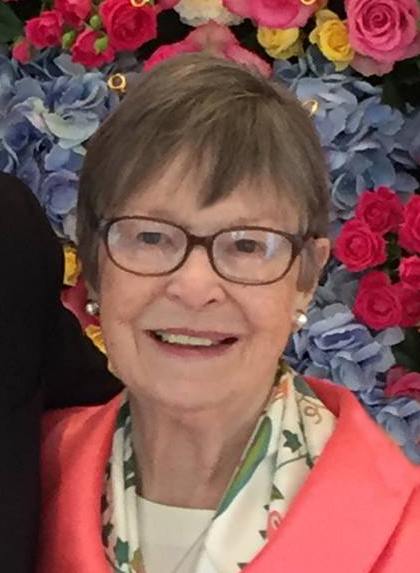 She was a longtime communicant of St. Mary’s Church in Holliston where, with her husband Jack, she was a charter member and officer of the Mr. & Mrs. Club. She also volunteered as a CCD teacher and Girl Scout leader. Mrs. Shannahan served as a member of the St. Mary’s Cemetery Committee, in Milford, MA, which helped to restore the cemetery’s Irish Round Tower. Helen loved to read and knit, and also loved to travel, especially to Ireland. She was an avid member of the Jane Austen Society of North America. She is survived by her five children: Lorraine S. Wenger of Amherst, NH, John D. Shannahan and his wife Suzanne of Holliston, MA, Mary-Caryl S. Ferdenzi and her husband James of Holliston, MA, Megan S. Hovsepian and her husband Ronald of Holliston, MA, and James E. Shannahan and his wife Ellen of Milford, MA. She was the devoted grandmother to sixteen grandchildren: Elizabeth Wenger, Paul Wenger and his wife Elizabeth, Johanna Wenger, John Patrick Shannahan and his wife Alyssa Russo, Erin Shannahan, Twins, Caitlin Lafferty and her husband Luke and Sarah Jackson and her husband Brendan, Kristina Dello-Iacono and her husband Scott, Twins, James Ferdenzi and Daniel Ferdenzi, John Hovsepian and his wife Laura, Courtney Vidal and her husband Eric, Kathryn Coffey and her husband Timothy, Thomas Hovsepian, Caroline Shannahan and Ainsley Shannahan. She adored her ten great grandchildren: Molly and Colleen Wenger, Effie and Julia Shannahan, Adriana and Olivia Dello-Iacono, John and Grace Hovsepian, James Vidal and Timothy Coffey. She was the sister of Carylann Lennon of Pittsfield, MA, and sister-in-law to Barbara Doherty of Cotuit, MA, and Claudia Sweeney and her husband John of Milford, MA. She also leaves several nieces, nephews, cousins and dear friends. She was the sister of the late Daniel F. Doherty Jr. and the late Edward Patrick Doherty. She was also pre-deceased by her son-in-law, Paul H. Wenger and her brothers-in-law, Cornelius E. Shannahan and his late wife Evelyn K. Shannahan, Regis X. Shannahan, and James F. Lennon. Her funeral will be held WEDNESDAY, DECEMBER 12, 2018, at 9:30 am from the Edwards Memorial Funeral Home, 44 Congress Street, Milford, MA, followed by a Mass of Christian Burial at 11 am at St. Mary’s Church, Washington Street (Rte 16) in Holliston, MA. Burial will follow in St. Mary’s Cemetery in Milford, MA. Visiting hours will be held TUESDAY, DECEMBER 11, 2018, at Edwards Memorial Funeral Home, from 4 pm to 8 pm. Memorial donations may be made to The Sisters of St. Joseph of Springfield, 577 Carew Street, Springfield, MA 01104.